Submitted not entirely respectfully by Vera Van Alst, of Victoria Abbott's book collector mysteries. In regard to your inquiry, I hardly know what to say about Miss Jordan Bingham. She really isn't at all what I was looking for in an assistant. She has managed to bring any number of chaotic situations to my home, and I have increased the insurance on my collection of rare first editions to reflect this reality. Although she seems preoccupied with fashion and that cellular telephone of hers, I must admit Miss Bingham has actually been an asset to Van Alst House. My collection has grown slightly and unlike her predecessor she can fulfill her duties without getting hit by a train. She could, however, learn to be more punctual. I must mention that the cats have shown a fondness towards Miss Bingham, and the Signora Panatone too, as evidenced by the extra trips to Miss Bingham's garret with various snacks and mid-morning meals. Perhaps one day she will stop hoarding those silly children's books and join me in collecting something worthy, until then, I suppose I shall allow her the privilege of maintaining my library. In a word, I would summarize Miss Bingham's work as satisfactory. You would certainly see what I mean by checking the record in The Christie Curse and The Sayers Swindle. I hope this correspondence meets your needs. Victoria Abbott is a collaboration between Victoria Maffini and her mother, Mary Jane Maffini. 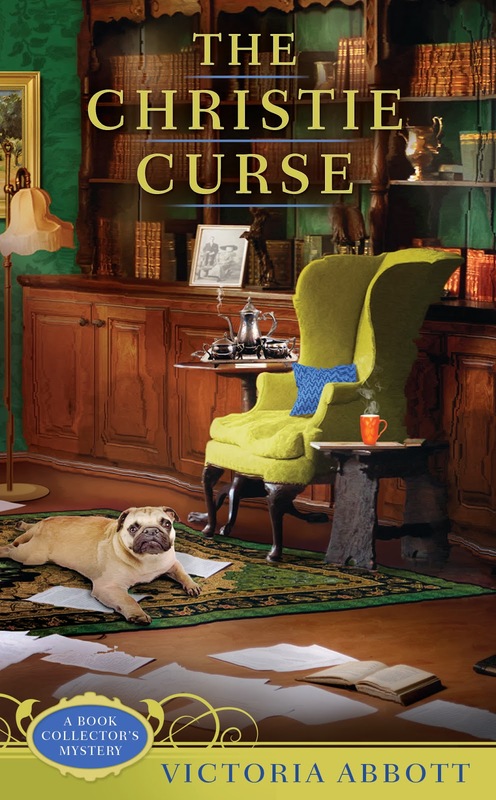 The Christie Curse, their first book collector mystery, launched in March 2013 and The Sayers Swindle, the second in the series was out in December 2013. Please let them know how you like the cover! Look for The Wolfe Widow in September. This explains what I so enjoy about this series! Go get 'em, Jordan! And, consider yourself so lucky, Ms Vera van Alst! Thanks, Lizzie. You're a bud. - Jordan. This is definitely my kind of series and I am looking forward to reading very soon. Totally loved the "interview" (letter) today; made my day start out with a smile. Thank you. Thanks, Cynthia! I'll pass it on to Vera and hope she doesn't take my head off. Oh, Ms. Vera van Alst is a character, for sure. She would think Jordan overly concerned with her wardrobe, wouldn't she? Wait, didn't she spring for a new outfit recently? Yes, Nancy. There was that silk blouse and let's not forget the diamond brooch. 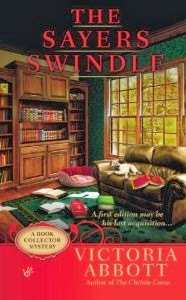 Loved the Christie Curse and just got Sayers Swindle. Look foward to learning more about Jordan's "uncles". Thanks, Mary Louise. Those uncles bear watching.